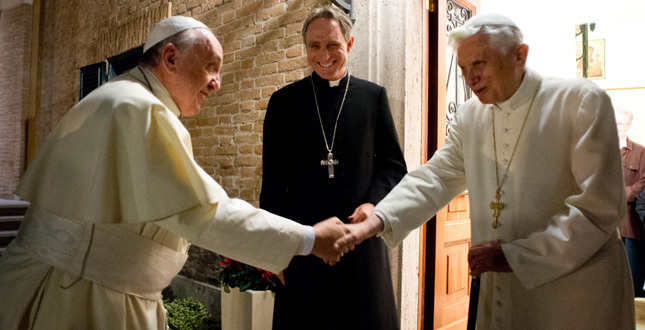 This year has been the year of two Popes, and it ended with the «image» of two joined Popes. On December 23, Pope Francis went to visit the Pope emeritus Benedict XVI: Christmas wishes, sunrises and photo opportunity, together with a Pope Francis invitation for lunch to Pope Benedict. This latter obviously accepted: he promised obedience to his successor since when he gave his farewell to cardinals on February 28, and he reiterated his promise to Pope Francis when Pope Francis called him on the phone shortly after his election. So, on December 27 the Pope emeritus went for lunch to Domus Sanctae Marthae, the Vatican hotel where Pope Francis lives. The Vatican secretary for relations with States, msgr. Dominique Mamberti, and the assessor to the Secretariat of State msgr. Peter Bryan Wells, had lunch with the two Popes, together with the two Popes’ personal secretaries. It is also striking that Pope emeritus visit to Pope Francis had not been announced via the usual channels (an anticipations of the Holy See Press Office bollettino to the press agencies, and then the Bollettino itself), while it was announced via Vatican Radio. This is the way through which the news are delivered if the Vatican does not want them to have such a relevance. This comunication strategy has been now enough experimented. Communication seems to have become the most important deal in the Vatican. Communication strategy grabbed importance during the Vatileaks scandal, when the Vatican perceived the need to hire an advisor for Communication for the Stae Secretariat, chosen in the person of Greg Burke. Communication strategy was pivotal for cardinals during the pre-conclave meetings, and this is the reason why cardinals in conclave chose for a «change of narration», according to a Wall Street Journal report based on the conversation with four different cardinals. Communication strategy is considered so pivotal to ask McKinsey to study a new Vatican medias strategy. With his charisma and his natural way to address the crowd, Pope Francis is the corner stone of this new strategy of communication. The risk is that the attention is more focused on Pope Francis gestures, while his words are left unobserved. In his “urbi et orbi” message of the Christmas day, Pope Francis, for example, listed countries that suffer conflicts or where Christians are persecuted. The day after, on December 26, Pope Francis spoke about persecuted Christians again, insisting on the issue as much as Benedict XVI did. These messages hardly grab he headlines of the big medias, with rare excpetions, while Pope Francis gestures are always well emphasized. In the end, a question remains: is professional communication adapt to the announcement of Gospel? Catholic Church message is eradicated on Truth, while communication need to emphasize emotions and images to be effective. One must argue that a communication plan may not be effective to announce the Gospel, while it can be effective to give a new image to the Church. Anyway, the new image risks to be untrue. Pope Francis, for example, did not break the tradition of the Church. His work and his commitment are rooted on a long term work and commitment made by previous Popes. The reforms Pope Francis has been working on since his election have begun under the previous Pontificate. And Pope Francis words are anyway in perfect continuity with the Church’s tradition, as the Pope himself said. Coming back from the trip to Rio de Janeiro for the World Youth Day and responding to a question, Pope Francis explained why he did not speak, during his visit to Brazil, about the changes in society, the abortion, the gay marriages. Pope Francis the gave a more in depth explanation of the reason why he was not addressing those topics in the interview he granted to “La Civiltà Cattolica”. Pope Francis words echoed those of his predecessor, Benedict XVI. On November 9 2006, he met the Swiss bishops gathered for a meeting in the Vatican. He spoke off the cuff, blaming on himself that he had no time to prepare a written speech, and underlined he had not intention to indulge on the small issues, while he prefered highlighting the big themes. Benedict XVI told: «I remember, when I used go to Germany in the 1980s and ’90s, that I was asked to give interviews and I always knew the questions in advance. They concerned the ordination of women, contraception, abortion and other such constantly recurring problems. If we let ourselves be drawn into these discussions, the Church is then identified with certain commandments or prohibitions; we give the impression that we are moralists with a few somewhat antiquated convictions, and not even a hint of the true greatness of the faith appears. I therefore consider it essential always to highlight the greatness of our faith – a commitment from which we must not allow such situations to divert us». Certainly Pope Francis re-read this words, while it is widely spoken about possible reforms at least of the Curia organization. Pope Francis pastorality and Pope Benedict theology can together help the Church to get out of the crisis. This two souls cannot be detached the one from the other. 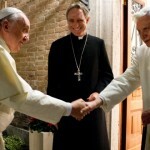 And this is proved by Pope Francis continuous seeking for Benedict XVI – a seeking that aims to show a continuity and a friendship among the two Popes. It is arguable that the need to show the continuity is part of a communication strategy, and would be aimed to do away with critics and questions raised up during Pope Francis pontificate, especially for what concerns a perceived lack of institutionality under Pope Francis. It may be. Anyway, the new year with two Popes will surely reveal that the Church’s doctrine has not changed. Pope Francis himself reshaped his revolution. His pontificate is not a breach with the past, as medias often depict it.